1. For brine, in a resealable plastic bag set in a bowl combine the 3 cups buttermilk, the coarse salt, and sugar. Cut chicken breasts in half crosswise. Add all chicken pieces to the brine; seal bag. Chill for 2 to 4 hours; remove chicken from brine. Drain chicken; pat dry with paper towels. Discard brine. shallow dish. Coat chicken with flour mixture. Dip in the buttermilk; coat again with flour mixture. 3. Meanwhile, in a deep, heavy Dutch oven or kettle, or a deep-fat fryer, heat 1-1/2 inches oil to 350º degrees F. Using tongs carefully add a few pieces of chicken to Dutch oven. (Oil temperature will drop; maintain temperature at 325º degrees F.) Fry chicken for 12 to 15 minutes or until chicken is no longer pink (170º degrees F for breasts; 180º degrees F for thighs and drumsticks), and coating is golden, turning once. Drain on paper towels. 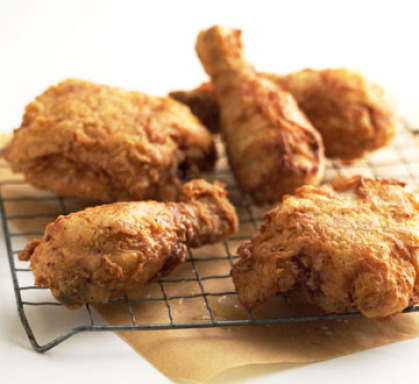 Keep fried chicken warm in a 300º degree F oven while frying remaining chicken pieces.